Hey dolls! Today I have a really fun and easy gel polish tutorial for you using some colors from the new Gelish "Hello Pretty!" summer 2015 collection (review & swatches here). 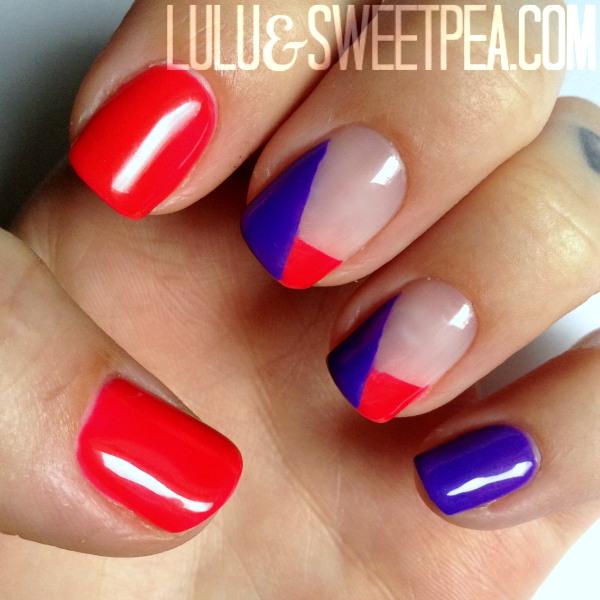 This tape manicure looks fancy but really anyone can do it, and you can use gel or regular polish. It's up to you! I'll be using the colors "Pop-arazzi Pose" and "Anime-zing Color!" You'll have to forgive the fact that I forgot to take step-by-step photos like I usually do, but it was very late at night and the lighting would have been horrible anyway. 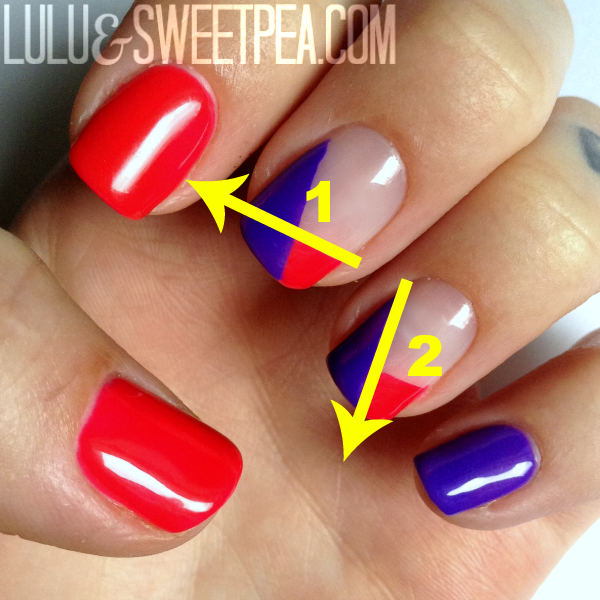 This manicure is pretty simple though, so I was able to edit a finished picture to show you how I achieved this look. I started off by prepping my nails for the gel polish application (if you need help with this part or need a refresher course, check this tutorial here first). Then I applied my base coat, cured it, and used a dry nail wipe to remove the tacky layer. Now you're ready to apply the tape. 1. Apply your first piece of tape diagonally, exposing the tip of your nail like I did with the first arrow in the picture (keep in mind that the first color you do should be your lighter color). Ensure that the tape is secure from edge to edge and that no polish can seep under it, then apply your gel polish. Don't forget to seal the free edge! Then cure. Apply a 2nd coat of gel, and cure again. Then peel your tape off and gently wipe the tip with a lint-free nail wipe to remove the tacky layer. 2. Apply your second piece of tape following the second arrow in the picture. Again, ensure that the tape is secure from edge to edge and that no polish can seep under it. Apply 2 coats of the second color of gel polish (the darker one), and cure between each coat. Peel off the tape and apply a layer of top coat to the entire nail, then cure. If desired another top coat can be applied (I prefer 2).